Some of 2009 crop. I'm especially proud of giant cucumber. I was first inspired to start a vegetable garden by my 99 year old neighbor and her 77 year old son. 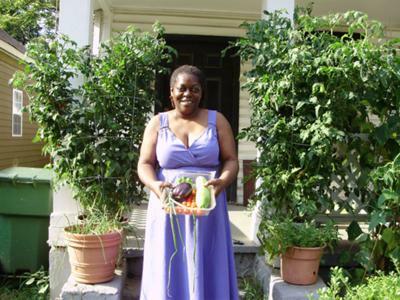 When I first rented a house across the street from them a few years ago, I noticed they were growing tomatoes in their front yard. Well, I wanted tomatoes too. The next year I decided on growing herbs to add to my garden, basil especially because I love Caprese salad. So I grew basil, chives, parsley, rosemary, sage and thyme. I grew these in 2 styrofoam ice chests from the dollar store that I cut down and poked holes in the bottom. I added red bell peppers and Habernero peppers (in their own pots) because I love them but they are so expensive at the grocery store. I also expanded my tomato repertoire to include beefsteak tomatoes. Everything grew well although I didn't get the yield I wanted from the peppers because I didn't know they should be staked. Last year I got really ambitious. I added cucumbers, eggplant, yellow and orange bell peppers, and scallions to the container garden. I also planted dill, cilantro, oregano, and mint. That's when the fun really started. I found out the more you grow, the more challenges can crop (get it, crop) up. I bought bush type cucumbers because I didn't think they would get very large. I trained them vertically on stakes. Those vegetable plants climbed to be over seven feet tall. You should have seen me scrambling to find something for them to latch on to. And why didn't anyone tell me about hornworms (ugh). Those voracious little creatures took huge bites out of my cherry tomatoes for 2 weeks before I knew what they were. It was recommended that I pick them off by hand. Well, that wasn't going to happen (I was scared of them). My neighbor finally got them off for me. For the most part it was a very successful season, except for the cilantro which bolted, and I enjoyed a bountiful crop. I was able to share much of my garden with relatives and neighbors. This year I'm going all out. In addition to the above, I'm going to grow peas, radishes, garlic, lettuce and zucchini. My plan is to be able to make a salad and ratatouille without going to the store. I would also like to plant a fall vegetable garden of broccoli, cabbage, cauliflower, kale and mustard greens, and butternut squash. I've tried to be better prepared by buying six foot stakes, more tomato cages, yellow plastic gloves (for hornworms) and I bought plenty of pots at the dollar store at the end of last season. Vegetable gardening is probably one of the most enjoyable endeavors I have ever done. It can take some work and it presents some challenges, but watching your plants come up and produce edible produce is one of the most rewarding experiences I have ever had - not to mention the savings. However, the biggest reward comes from the eating. Home grown produce tastes 100 times better than anything you can buy at the grocery. So everyone please wish me luck. Hope everyone has a happy garden and may you all be fruitful. My name is Val and I live in the Southeastern part of the US. Any suggestions or comments would be appreciated. I have read your ever expanding gardening ideas. I too am a beginner gardener in containers. Where I live is an apartment but have a very large outdoor patio. I have planted tomatoes, squash (which the bugs got to), egg plant, green and orange bell pepper, collards, and all types of herbs which include, sage, rosemary, basil (which a something ate the leaves, don't know what), oregano, etc. I too live in the Southeast, Gainesville, FL. I am planting winter squash, more greens, cabbage, etc. I really enjoy eating my own vegetables because they are organic and I don't have to pay high prices for organic veggies. I am beginning to branch out and try other veggies and probably fruits. I've recently planted a veggie garden in a small 3ft wide strip which runs the length of our new home. Being extremely inexperienced, I planted whatever seeds were available at the local nursey. Broccoli, broad beans, peas, carrots, spinach, and then an array of herbs like thyme, rosemary, mint, dill and lemongrass. I am COMPLETELY blown away by the results. I have had to cut back everything. The dill plant is 3ft tall! I am harvesting my spinach, carrots and broccoli at the moment....learning as I go....and wonder what else I could try in the limited space. Does butternut squash require lots of creeping room? You're doing great Charmagne, well done. Try a bush variety of butternut squash and maybe same with courgettes - I like yellow or light green courgettes as they have a better texture. Just wondering if summer 2011 was a good growing year for you, since we live in similar climates. Here in Oklahoma City, my new raised beds produced wonderful tomatoes, green beans, radishes, and peppers for about a month. Then, we had 68 days of above 100-degree temperatures and a plague of grasshoppers and hornworms, the likes of which have not been seen on this earth since biblical times. I thought about you --- and hoped you had better luck. I grow strawberries in containers, I also have a raised bed I grow vegetables in. Just purchased a patio garden container from Sam's Club. Planted tomatoes, basil, and thyme. Already have tomatoes the size of a silver dollar. The thyme is so pungent, I am going to chop some today to put on my turkey burger! Love the look of your veggies! Val, I'm amazed at your ingenuity! That cucumber was a whopper, for sure. Please read my blog on this same website to learn how I dealt with a hornworm invasion. You are what it is all about! You are doing this inexpensively, using your love for gardening to solve the problems you encounter. Try using BT (Bacillus Thurigensis, I am not sure of the spelling) to get rid of hornworms. It is a fungus that you spray on the leaves and the caterpillar eats the leaves and dies. I have not tried it because I don't mind touching them. Thank you, Val, you are officially my gardening inspiration! Very good. I am just retiring and getting my hands dirty in my small space. You are awesome! I'm starting a garden this year- some in ground, some in pots. Finding affordable pots is the biggest challenge. That sounds amazing! I've always thought that not having the room, or not being able to dig up a yard (or not having a yard to dig up!) was an excuse not to have a garden. I just planted out Chinese Bok Choy yesterday and today l will plant lettuce. Really is a great feeling to grow your own. Wonderful blog, helps me to keep inspired reading others who enjoy the same... thanks Val. Thanks for your article. Very inspiring. Wow. Your container vegetable garden is great. I'm so glad you shared your experiences with us. If everyone did what you've done there would be fresh and healthy food for everyone! You are soooo right about the flavor of homegrown vegetables. My kids tell me, "Mom! Taste the sunshine!" Nurturing a garden is like nurturing kids, and I love it. It calms and soothes me. Good luck to you and keep up the great work! Enjoy! One resource I found very helpful for small gardens (particularly if you are renting an apartment or have no yard) is the Fresh Food From Small Spaces book by RJ Ruppenthal. Lots of container gardening going on these days and I wish people would realize that they can grow a salad or get tons of tomatoes from just a pot or two. I think that what you have done so far with your container vegetables is fantastic, I agree the pleasure you get from growing your own food is wonderful and rewarding, and it's good that when you come across the problems you can get, we all learn from them. Keep up the good work, preparing my vegetable garden now for the spuds and then growing as much as I can, thank you for sharing your experience!!!! I was thrilled to read about your experiences and to see as time went on you were becoming an `expert`. The only way to learn is to do it - right! Well done - great writing too.